Asia emerged victoriously at the 2014 Asia – Europe All Stars Challenge (Asian Event) –. After second day of fierce battles host Continent preserved the advantage gained on the first day. Adrian CRISAN scored for Europe like day earlier and Robert GARDOS added another point today. Europe – Asia 4:6 was the final score. The day2 of the 2014 Asia – Europe All Stars Challenge (Asian Event) started. Asia had 3:2 lead after opening day of the Event. Opening match of the second day brought two left-handers to the table. Whole first game was very close as both players could not secure wider gap, until 9:9 when Jun made two excellent services. TAN failed to produce good return of service and it was 11:9 for Jun. The much better start from MIZUTANI was seen in the second game. TAN was still thinking about last two point from previous game and his adversary took full advantage of it: 5:1, 8:3…Finally TAN produced two big forehand spins and it was 8:6…TAN was back, but Jun preserved minimum advantage with 9:8 and Japan’s player had a service -10:8. Great rally brought Jun to 2:0 lead, it was 11:8. Again, MIZUTANI made a gap, 4:2 in the opening stage of the third game. Time-out was needed for TAN. Croatia’s player struggled since Jun is good in defense as well. MIZUTANI kept the distance at the same level: 7:5, 8:6. It forced TAN to change the tactics; he came closer to the table and it paid off. TAN made four quick points and narrowed the gap to 8:10. Jun was passive for 9:10, no risk in next one for 10:10. The game was leveled once again at 11:11 after two great points in counter-attacking. Audience enjoyed the game but they were silenced at match ball for Jun at 14:13. The unbelievable flip from Tan made direct point on service of Jun! It was 14 all before Jun created another match ball. Jun called for time out and suspense rose. At 15 all TAN proved once again that he is not the player who will ever quit – 17:15 for him and 1:2 in games. 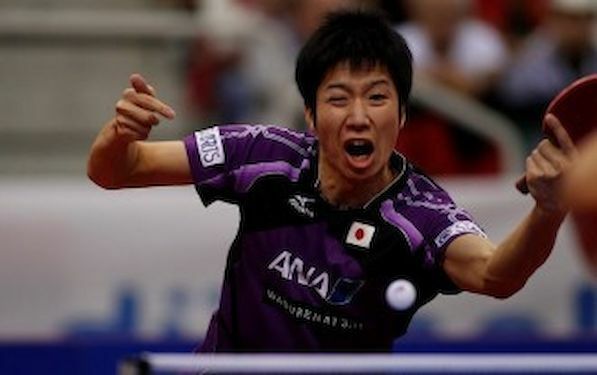 Angry Jun entered fourth game with 3:0 lead, and then 5:3, 8:6…. We saw great table tennis from both sides and little touch of luck for Jun with one edge ball at 10:6. It gave him 4 match balls and he made it at 11:7. After slow start of the match with 3:3 and 4:4 Adrian CRISAN was the first to make a gap at 6:4, 9:7. Great forehand gave him further advantage to seal the game at 11:8. TANG changed the pace. He had stronger start at the beginning of the second game. From 4:1 to 8:4 he looked very determined to win this contest. CRISAN came close at 8:7, but TANG Peng found the rhythm to stay in the match. It was 4:1 at the beginning of fourth game for CRISAN and last chance for TANG with time-out from coach WU Jing Ping. Big points followed but CRISAN radiate: 5:1, 5:3, 7:3. Everybody applauded him after 9:4 and finally at 11:5. At the beginning of the third duel of the day, Panagiotis GIONIS had some pain in his right shoulder. However, the hope was still alive since CHUANG is not the player famous for best of performance in matches against choppers. Already at 1:1 in the opening game we saw spectacular points from defense to counter top-spins. It was 6:4 for Greek player, but CHUANG fired back. It was 7:7, 8:8, 9:9, before CHUANG showed patience to overcome GIONIS defending skills and secures 1:0 lead. Until 4:4 in the second game both players kept the score under control, but it was CHUANG who managed to took off with four consecutive points. He made it 8:4, 9:5 before he closed the game with big forehand at 11:6. Taipei’s player showed no trace of mercy in the beginning of the third game. It was 4:2 and 6:4 before call from time out came from the European bench. It could not help. CHUANG sealed the match in his favor. Everybody was excited to watch XU Xin playing. Bastian STEGER had enormous challenge in front of him. From the first moment XU attacked: 4:1, 7:5 for XU and easy 11:5 first game. Few minutes later 3:0 forced coach PRAUSE to call for time-out. After 6:2 and few nice strokes for spectators XU finished in great style with 11:4. Asia was already a winner before the duel between Robert GARDOS and GAO Ning started, but both players are well known professionals and big fighters, so we saw another nice match. Robert played aggressive from the beginning and after 6:4 he made three points in the row and closed the game at 11:6. Robert won the second game in similar style with the same result 11:06. More suspense was in the third game. At 8:6 for GARDOS, GAO called for time-out. After 8:8 the great backhand from Robert followed with edge ball for last point for his win.